This very private and luxurious 2,000 square-foot home is sited on rolling foothills above the Yellowstone River just 25 miles south of Livingston and 30 miles north of Yellowstone Park. The architect-designed home is surrounded by three mountain ranges and features 9-foot ceilings and 8-foot doors throughout, a vaulted beamed ceiling in the living room with soffit lighting, and rustic native yellow pine floors and trim. Tastefully decorated with art and artifacts, the McCulley Cabin feels like a luxurious private home rather than a vacation rental. The secluded location and attention to design and aesthetic details set this home apart from others in the valley. It is an extremely comfortable place to stay for a few days or a few weeks. Huge picture windows and sliding glass doors in every room provide views of Emigrant Peak, the Gallatin Mountains, the Absarokee-Beartooth Mountains and the Crazies! You wont know which window to look out as each provides a spectacular view of snow capped peaks. Radiant floor heating throughout makes the cabin very comfortable for winter visits. The gourmet kitchen is the focus of the main living area and is the perfect setup to socialize while cooking with family and friends. The cabin is very tastefully decorated with unique Native American artifacts, vintage cowboy art, and some pieces by local contemporary artists. Some of the furniture is from the company that made furniture for the old Yellowstone Park lodges. The cabin is less than a mile from the Yellowstone River. Also about a mile away is the famous Chico Hot Springs Resort and Day Spa. Chico offers hot spring pools, guided outdoor activities such as horseback riding and whitewater rafting, fine dining, a grill, and a saloon with live music several nights each week. Fine dining is also available during the summer at the Yellowstone Valley Lodge and year-round in Livingston. A love of fishing, nature and big beautiful spaces brought us to Montana in 1997. We fell in love with the area, purchased a 20 acre lot and built this cabin in 1999. I think it's one of the most beautiful places I have ever been, am reminded time and time again when I visit from my home in Seattle. 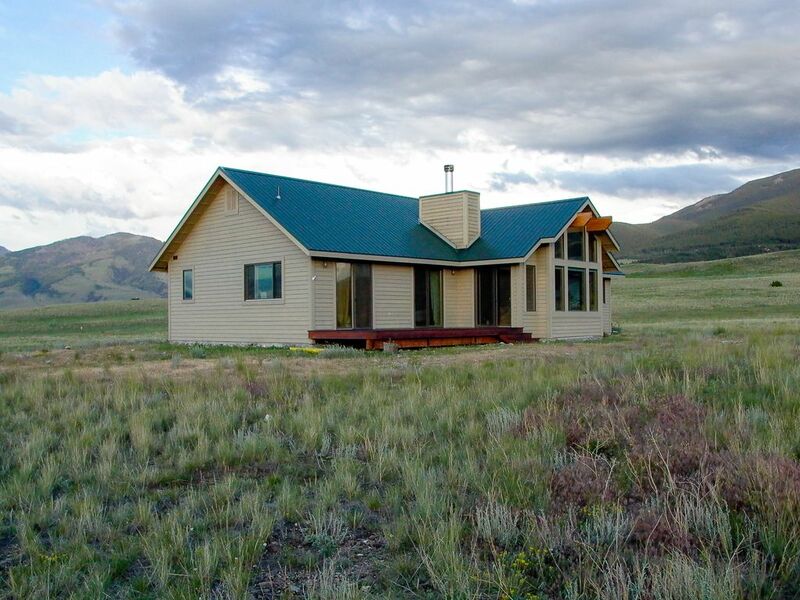 The property is excellent for birding and in the winter months, deer and elk are often seen grazing nearby. We are close enough to Chico Hot Springs that you can easily drive down for an early morning soak before breakfast. All bathrooms feature heated tile floors. 360 degree mountain view including Emigrant Peak, the Gallatins, Beartooths, and Crazies. The view from this home is as good as it gets and people can find themselves wandering from one room to another to take it all in! Our cabin is filled with historical maps and photos of the region, vintage Indian artifacts, collectible Western Art, Native photos and books. Feels very remote, yet it's just a short drive to the local saloon or a five star restaurant with an incredible wine list. Could not have asked for more on our honeymoon! As other reviewers have mentioned, the cabin/house is literally surrounded by beautiful mountains--It makes you feel like you are a million miles from nowhere! While being super secluded and having all of the privacy you need, the house is actually in very convenient location. Wonderful restaurants and a convenience/grocery store with anything you could ever need are just a 5-10 minute drive away. Day trips to Yellowstone are very doable, as it is only 35 minutes to the North Entrance. The house is very clean, nicely decorated and the bed was incredibly comfortable. We have ZERO complaints and cannot wait to come back! This house/cabin is located on a beautiful spot, surrounded by mountains. Only about a 30 minute drive to the North entrance of Yellowstone. The house is equipped with almost everything you need and is very comfortably furnished. Beautiful views from every room. Loved having the washer and dryer. Truly enjoyed our 10 night vacation. Friends of ours stayed at this property several years ago. We saw their pictures and were so impressed, we promised ourselves that we would stay there when we planned a trip to Yellowstone. We are so glad that we did! We stayed 5 days; we went into Yellowstone NP 3 days and spent 2 days at the house. There are many properties to choose from in the Paradise Valley, but this house seems unique. It really has an upscale feel to it, is well designed and furnished with western theme antiques and comfortable yet stylish furniture. There is no doubt that this was designed as a personal house for the owners, not a rental property. The owners leave many personal items there and ask that renters treat things with respect. Even the medicine cabinets have many items in them. The kitchen is well stocked with non-perishable items, so it is best to visit the house before going to the grocery store. The setting for this house is just wonderful. The location is grassland, the nearest neighbor is at least a quarter of a mile away. It feels remote, but it is only 6-8 minutes off the highway. There are mountain views in all directions, sunrises and sunsets are events not to be missed. It just feels so open, you can see for miles and miles, but it definitely can get windy at times. And because there are no trees for shade, the house will get warm from direct sunlight by mid afternoon. You do have to make some efforts to keep the shades closed on the windows and sliding doors that are on the sunny sides of the house. And when the sun is not shining on those windows, you will want to raise the shades again to take in the view. With the shades and ceiling fan, we did not feel that the house became too warm, although we were there in early June. One negative thing for us: several of the sliding doors in the bedrooms and the kitchen have drapes made of very heavy fabric, which does a great job of blocking sunlight, but also make the room very dark, and there is no way to pull them back and hold them in the open position. We wished there were holdbacks of some kind. The only other negative was the height of the king bed in the main bedroom; it is HIGH. If you are not tall, you will definitely need to use a chair to climb into this bed. The owner provided very clear directions and instructions prior to our arrival, so we were not left wondering how to get into the house. The one time we needed to contact him, he responded quickly by email. We highly recommend this house! Thank you for the review Rick! I understand about the drapes, in the past I've just tucked them behind a chair but agree that having some way to tie them back would be a better solution. Absolutely beautiful and remote property. Loved every second of our stay! We made friends with the extra large rabbits and the deer that roamed nearby every night. We spent 8 days in this amazing rental, and this was a return stay. It had been five years since our last visit for our 20th anniversary, and after much deliberation, we decided to come back for our 25th. We are so glad we did! The weather was less than favorable, but Paradise Valley, and Yellowstone are so amazing, it just did not matter. We spent four days in the park, explored Chico, Livingston, and The Grizzly Bear Exhibit featuring Brutus(a must see). We had a wonderful meal at Chico for our 25th, a memorable 50th birthday celebration with some very special locals at The Old Saloon, and found some hidden trails in the mountains for a crazy rainy day of hiking! The Cabin/House has a magical way of making you relax, recharge, and rediscover yourself! Thanks for fantastic views, fabulous cooking supplies, and a fireplace to die for! Even though we had to spend some time on the phone with Direct TV to get it going for the season, we would never stay anywhere else(I didn't spend a single moment watching TV by the way)! Thanks Mark for sharing your very special home with us! We did not want to leave. It was all we remembered, and more than we could hope for. WE WILL BE BACK! Thank you! So happy you had a nice visit in spite of the cool and wet weather last week. Apologies for having to call the satellite TV company, you're the first guests we've had in several months and I guess the system needed to be re-activated. Hope to see you back soon! Do your homework and know what expect. It occassionally gets windy and the home can be a little tough to locate at night, without GPS, none of which are a secret. So, to this I say so what! The home and its surroundings are in one word MAGICAL. There is an amazing collection of birds in the area, eagles, hawks, bluebirds, pheasant, grouse. No hunting is allowed on the property. Rates are subject to change until reservation is confirmed. Winter guests are strongly recommended to use winterized AWD vehicle and be prepared for (very infrequent but possible) impassable roads and/or driveway.